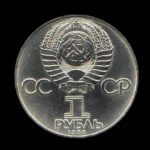 For more than two centuries of history of the Russian monetary system did not exist or wasn’t custom to mint commemorative coins. The few editions dedicated to some historical events, such as memorial rubles in memory of the 100th anniversary of the War of 1812, or the 300th anniversary of the House of Romanov, or 200th anniversary of Gangut victory are very rare. 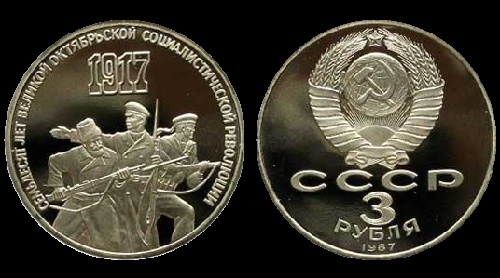 Banknotes and coinage of the Soviet state didn’t mint commemorative coins either. 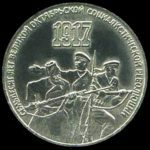 The tradition of minting commemorative and jubilee coins began only in 1965, when was commemorated the 20th anniversary of the Victory over Nazi Germany – metal rubles with the image of the monument in Berlin’s Treptow Park, created by Vuchetich. 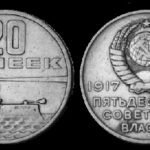 Since then appeared the whole series on a particular theme, such as “Monuments of the Motherland”, or The Great October Revolution Coins. 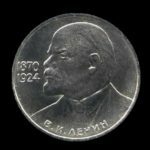 This series began, perhaps, in 1924: then went into circulation silver ruble and fifty kopeks, the symbolism of which fits into the theme of the October, and reflects the ideas proclaimed by the revolution. 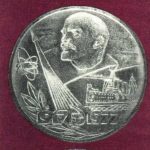 The tradition of minting commemorative and jubilee coins began only in 1965, when was commemorated the 20th anniversary of the Victory over Nazi Germany – metal rubles with the image of the monument in Berlin’s Treptow Park, created by Vuchetich. In one case, the workers and peasants at the beginning of a new life in another – blacksmith making peaceful tools for peaceful labor. 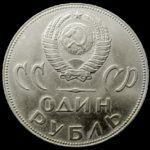 The series, which consists of coins in 1O, 15, 20, 50 kopecks and 1 ruble, marked the fiftieth anniversary of the Great October Socialist Revolution. Sketches were made by Goznak Moscow artists. The manufacturing process of coin is very complicated. According to the approved sketch master engraver sculpts in wax or clay – the size of 5-6 times more than natural. The height of the relief is only one millimeter. From the carefully crafted original the plaster cast is removed, according to which of the special plastic is made a solid model. Then on engraving – copying machine, the image is reduced and converted to metal. Finally, the engraver manually corrects it. The result is the ready instrument with which the coins are minted. 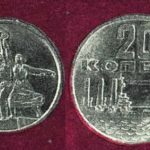 On the ruble and fifty kopeks (they have one and the same image – the figure of Lenin on a background of massive hammer and sickle) worked Nikolay Filippov, who has worked at the Mint for 32 years. 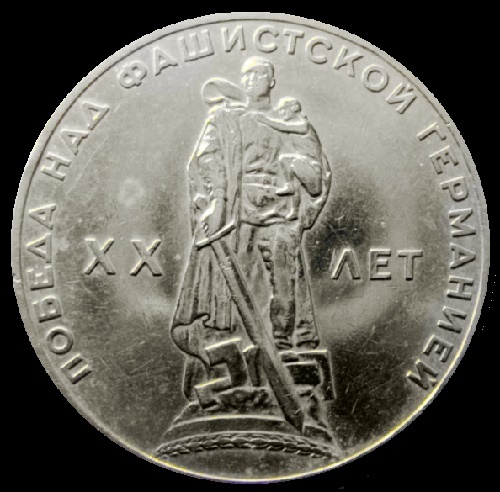 Nikolay participated in the creation of the medal of the Order of motherhood and “Heroine Mother”, Olympic coins, he is the author of souvenir medals, known to all by badge “Honorary railwayman”. Dime and twenty kopecks of this series were minted with instrument of L.S. 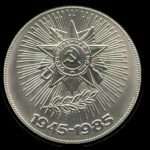 Komshilov, 15 kopek coin – A. Kozlov. At first glance, the coin is not much different from the medals. But there are differences, and very significant. The most important of them – the height of the relief. 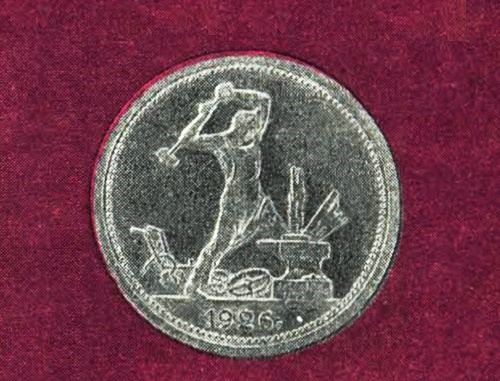 If in the medals, especially not the premium, the sculptor is substantially free of any restrictions, then work on a coin imposes very stringent requirements: the height of the relief image must not exceed two tenths of a millimeter, and in small – less than half. So all the details of a portrait under these conditions – not every experienced the sculptor is able to do. In the October series determined the personality – the portraits of the founders of Marxism-Leninism. 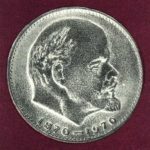 First was minted the ruble in 1970 to the 100 anniversary of Lenin’s birth. 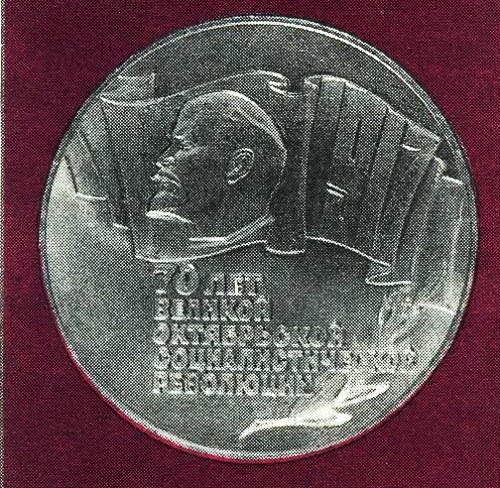 Thumbnail author (as well as coins in honor of Marx and Engels issued in 1983 n 1985) – artist of the Moscow Printing Factory Goznak VA Ermakov. The tool is made by NA Sokolov – then the chief artist of the Leningrad Mint, Honored Artist of the RSFSR. Please note: this is a classic type of image. On the reverse a five-ruble coin – a bas-relief of Lenin on a background of a stylized banner of cloth, which folds form the date ‘1917’. The composition is completed with the inscription “70 years of the Great October Socialist Revolution” and a laurel branch. By the way, this coin (the diameter 39 mm) – the largest of the issued in the USSR. Obviously, the size of it was somewhat great: indeed, it resembles a desktop medal. Therefore, in the next issues, 5 ruble coins became smaller – diameter of 35 millimeters. 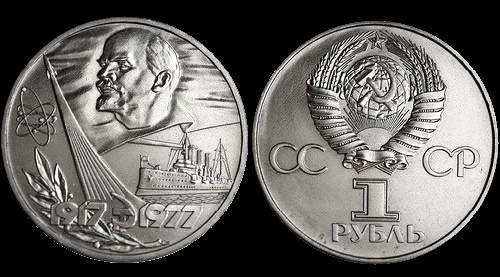 Later commemorative ruble coins marked the 60th October anniversary of the USSR, the 115th anniversary of Lenin’s birth. 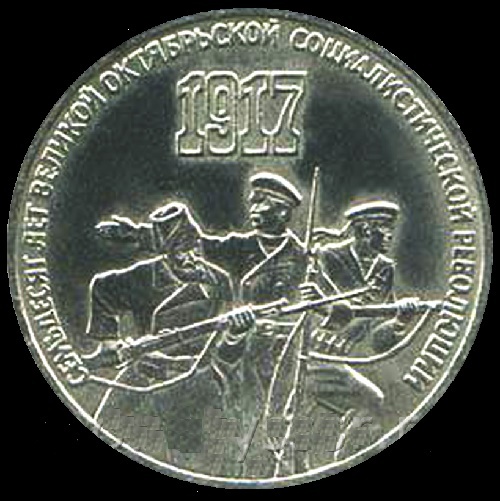 The release of three coins marked the 70th anniversary of the Great October Revolution. And for the first time were put into circulation copies of 5 rubles. 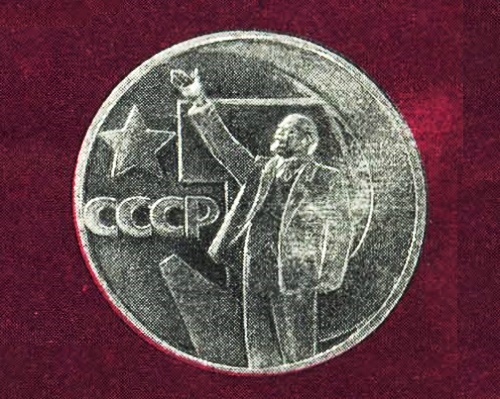 Ruble coin of this release (sketch by Vladimir Nikitin, the chief artist of the Moscow Printing Factory Goznak) was sculpted by LS Komshilov. 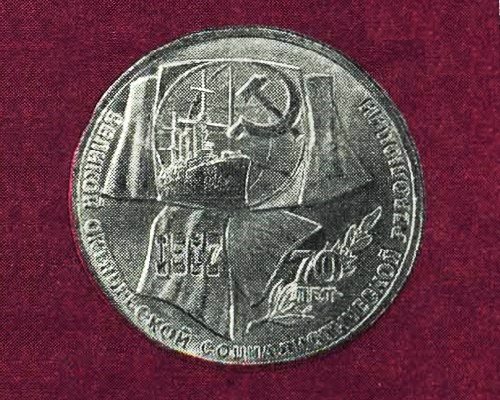 An interesting fact related to the work on this coin – the image of “Aurora” on the coins are different: on the twenty kopecks released in 1967 is a generalized image of the legendary cruiser, designated the spotlight and the gun shot; on the ruble of 1977 the image is worked out more in detail, showing even tackle; the last appearance of the ship on the coin is most probably closer to reality. 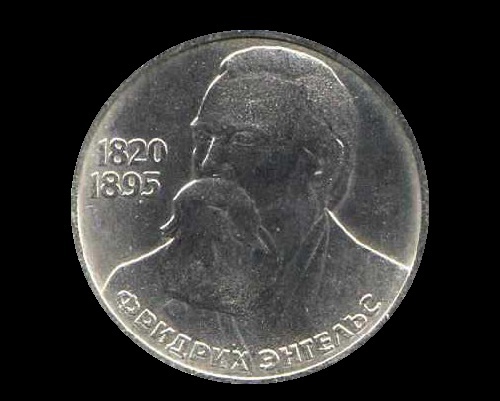 Three-ruble coin of this cycle sculpted S. Ivanov. Complicated in the execution composition (three figures in movement and different angles) displays the main forces of the revolution: a soldier-peasant, a worker and a sailor with rifles in their hands. 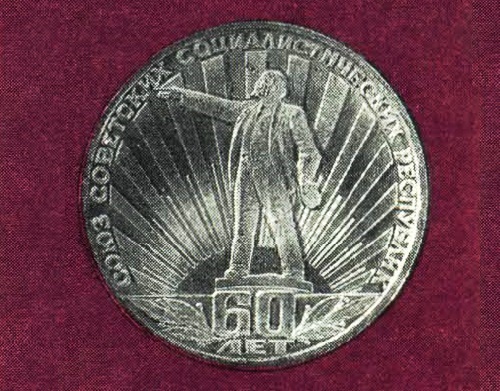 Sergey Ivanov worked on the ruble to the 60th anniversary of the USSR. He is the author of more than thirty souvenir medals. He created a series of “Hermitage”, “Sculpture in the Summer Garden”, “Russian Museum”. On old coins you will not see the portraits made from the front: it is always in profile. It is easier to portray, to achieve the greatest resemblance to the original. When the position from the front (or almost full-face), lying in those tenths, hundredths of a millimeter, it is extremely difficult to achieve expression. 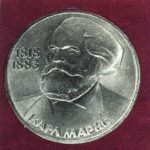 There must be a special feeling of relief, metal, which fully possess engravers, medalists – such as NA Nosov – he was working on a portrait of Engels, or Kozlov – his instrument minted jubilee ruble to the 100 th anniversary of Marx’s death. 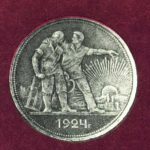 From the Olympics-80 specifically for collectors in domestic coin actually introduced an innovation: it was launched into circulation coins of high quality (in international numismatics such technology is indicated by the English word “proof”). In this case, the process of creating a coin is greatly complicated. Firstly, the engraver has to do more relief than usual, given the fact that the plane of the stamp will then be polished to a mirror finish. But even before polishing the image of “matting” – processed with sprayed air jet abrasive powder – why it becomes a silver-matte, as if lit from within. Finished products can not be touched with hands: it is placed in a plastic etui. In such an embodiment Mint re-minted all previously released jubilee and commemorative coins, since the release of 1965, including the October series.